Raj Ahtan, ruler of Indhopal, sought to bring all of humanity under his rule - destroying anything and anyone that stood in his path, including many friends and allies of young Prince Gaborn Val Orden. But Gaborn has fulfilled a two-thousand-year-old prophecy, becoming the Earth King - a mythic figure who can unleash the forces of the Earth itself. And now the struggle continues. Gaborn has managed to drive off Raj Ahtan, but Ahtan is far from defeated. 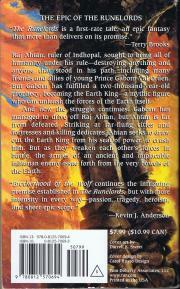 Striking at far-flung cities and fortresses and killing dedicates, Ahtan seeks to draw out the Earth King from his seat of power, to crush him. But as they weaken each other's forces in battle, the armies of an ancient and implacable inhuman enemy issue forth from the very bowels of the Earth. "Brotherhood of the Wolf continues th intriguing premise established in The Runelords, but with more intensity in every way - passion, tragedy, heroism and sheer epic scope."